"Intel UHD 620 graphics remain an entry-level part, and though you might get away with a spot of light gameplay in older, less-demanding titles, serious gamers are going to want to attach a Core v2." 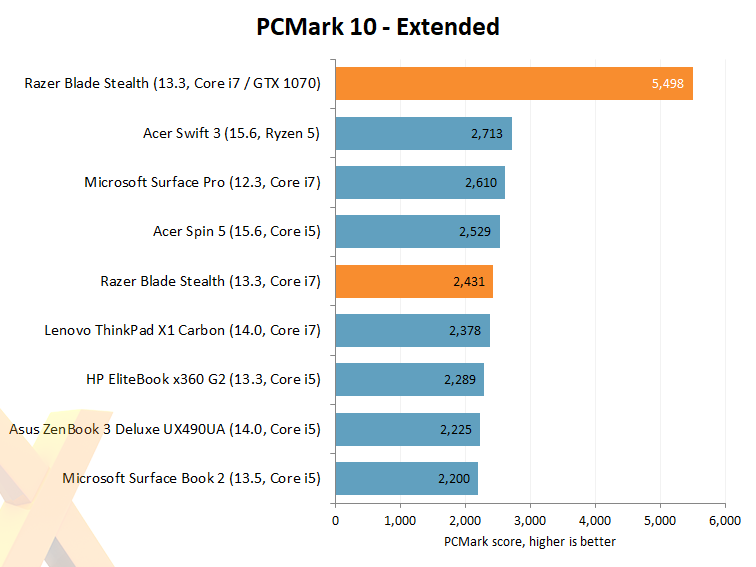 That was how we described the Blade Stealth's baked-in graphics potential in a recent review, and it's amusing to see how big a difference Core v2 can make. 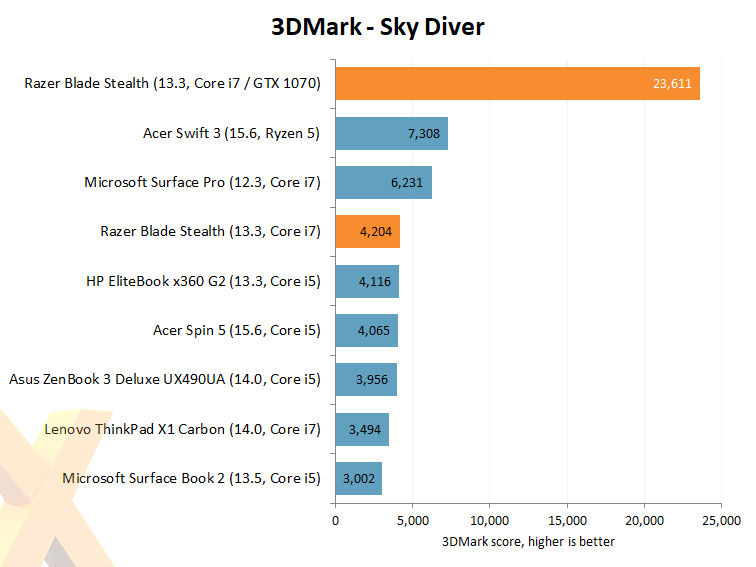 Outfitted with a GeForce GTX 1070, we see the PCMark score increase by around 125 per cent, while 3DMark Sky Diver performance is boosted by nearly 500 per cent. Such gains are tempered by the fact that the Core v2 and GTX 1070 combination costs around £1,000, so it ought to be quick, but these two graphs alone prove that an external graphics card has merit. There's more to it than first meets the eye, mind. To see if we're getting close to realising the full potential of the GTX 1070, we've compared the Core v2 to a desktop test machine outfitted with an Core i7-6700K CPU and a Gigabyte GeForce GTX 1070 GPU operating at slightly lower frequencies than the EVGA card attached to the Razer. Despite the slight GPU clock-speed advantage, the Blade Stealth and Core v2 combination, with internal or external monitor, struggles to replicate the GTX 1070 numbers we see on a full desktop. The 15 per cent performance deficit can most probably be attributed to the supporting hardware in each platform. Blade Stealth's 15W Core i7-8550U CPU simply isn't going to match the under-load frequencies of our test machine's 91W Core i7-6700K.